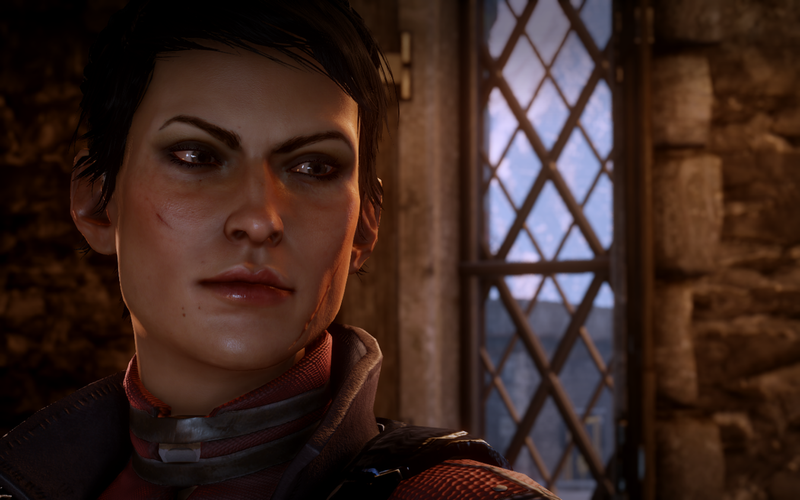 she'll be a valuable companion in DAI. Just don't piss her off. As gorgeous as the game's environments and vistas can be, for me it's the characters in Dragon Age: Inquisition that resonate and stay in my memory—all of which are rich, entertaining, complex and beautifully written. As a gamer, I enjoy visiting the world of Dragon Age often, but I'm not there for the scenery—I'm there to visit its gorgeously rendered characters, companions and advisers—all of whom are complex enough to feel like beloved friends. As Dragon Age: Inquisition unfolds, just as in DAO and DAII, the Companions and advisers to our protagonist in Dragon Age: Inquisition all share a few basic qualities: They're all brave, gifted, desperately seeking redemption... and lonely. Each companion is, most of all, desperately alone in some intrinsic fashion that goes down to their very soul. Each is seeking connection, a cause, something and someone to believe in. And each—we'll soon learn—is at a crossroads, whether of faith, alignment, loyalty, or belief. warrior—as well as a secret fan of romantic drama. The first Companions we meet in DAI are Cassandra, the fiery, strong female Seeker warrior we first met in Dragon Age II, and Leliana, the quietly deadly bard and spymaster we met in Dragon Age: Origins (provided, of course, you visited the Lothering Chantry). Possibly no transformation or character arc is as startling or as moving as Leliana's—the charming young woman who was once our Warden's sweet, optimistic companion in Dragon Age: Origins is now a subtle and ruthless assassin who lives and breathes secrets, and whose delight in intrigue is exceeded only by her ruthlessness. Yet there are still signs of the girl we knew—Leliana still shows flashes of humor and sweetness, she still raises nugs as pets, and she still sings like an angel. She's also fiercely loyal, and while her inner circle is small, she would die for any of them without hesitation. Cassandra, meanwhile, hasn't changed nearly as much (thank goodness). As DAI begins, she's still beautiful, blunt, fierce, and stubborn, but as always her loyal heart, tenderness and romanticism reveal themselves early on, even during the first early journeys with the Inquisitor. Cassandra's initial overzealousness is even revealed to be the product of a secret and understandable grief later on. As always with our DA companions, nothing—and no one—is ever quite what they seem to be at first glance. 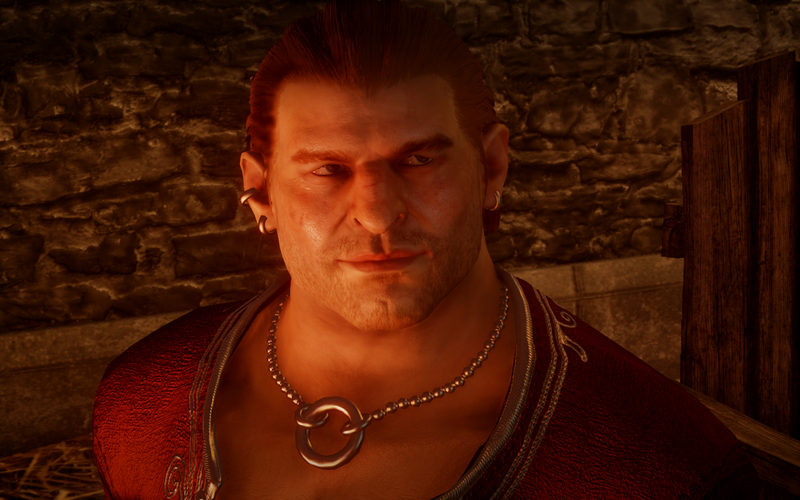 alas, Varric's still not romanceable (a tragic waste of chest hair). We then meet up with our old friend Varric, the rogue, merchant, and pulp writer with the incomparable chest hair and uncomfortably close relationship with his crossbow Bianca. Varric's back from his narrow shave in Kirkwall, and because of the catastrophe across the land, he's now partnered up with his old nemesis Cassandra to do his part. And if you played DA2, you understand why Varric is guilty and fearful over the fact that he may have had a hand in bringing this catastrophe to pass. Also traveling alongside Varric is a new character, an elven apostate named Solas, who very quickly demonstrates complex knowledge about the terrible breach in the sky (as well as about the magic/dream world of The Fade leaking through it). 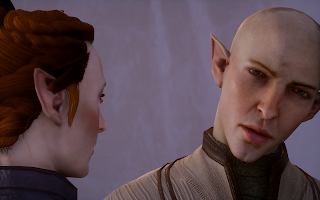 Solas is unassuming and quiet, but for those who look closely, he's already a fascinating and mysterious character. 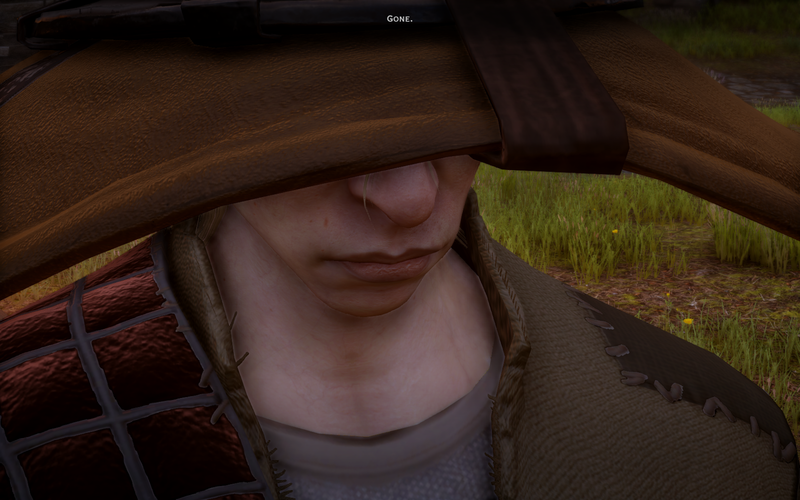 He's not Dalish (he wears no traditional face-tattoo) but is obviously not a city elf, either. He's proudly self-taught and is actually surprisingly confrontational in initial spirited debates with an elvish Inquisitor, revealing that he's not especially supportive of the Dalish OR the other elvish groups currently eking out segregated existences in alienages (conversations that are pretty sparky, challenging and fun if you decide to romance him). It's our first clue that Solas is someone who is worth exploring further as a character. and spirited debates, but he's not a fan of group singalongs. Meanwhile, the group eventually finds its way to early headquarters Haven, where we meet with our old friend Cullen, who's new an advisor—a Cullen who's now achieved maximum hotness, but there's a gentleness and sadness to him that is new to the character, and that adds a welcome complexity. He's joined by Josephine Montilyet, a diplomat who may be sweet as pie, but she navigates world politics and Orlesian deviousness with equal aplomb (even if she still, we find out later, plays with dolls when no one's looking). Alongside Leliana, these three people become our core council, and meet with our hero repeatedly throughout the game at the War Table to discuss quests, options, strategies in your fight against evil. They also increasingly reveal their own fears, frailties, and humanity to your hero depending on how you play (and whether you choose to romance them, in the case of Cullen or Josie, as the romances further expose their vulnerabilities). After a few more early storyline quests, we acquire the rest of our intrepid crew, and they as before are a group of incredibly complex people. You'll meet Sera, the funny, pugnacious and tough leader of a network of thieves and revolutionaries called The Red Jennies, and Sera's a mishmash of wonderful contradictions. She's hard as nails yet achingly vulnerable; she's an elf yet she utterly discounts and ignores her own race (and is in fact palpably racist against other fellow elves). 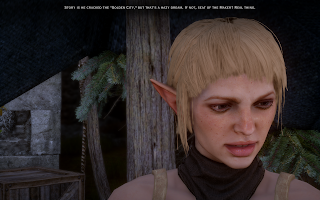 She's adept at a shrug and a joke, she pretends to be uncaring, but Sera cares deeply about the common people, the peasants of Thedas who are most affected by the catastrophes afflicting the world. She's also witty and hilarious, but she can be startlingly rude, and in more than a few scenes I actually chose for my hero to tell her to shut up, because she was genuinely upsetting me. At about the same time you meet and recruit Sera, you also meet her polar opposite, the icy and elegant Circle mage Vivienne. 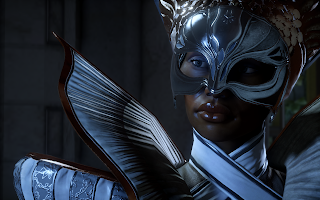 Voiced by the always fantastic Indira Varma, Vivienne is at first easily pegged as a snooty courtesan who strategically avoided the real hardships of mages by scheming and sleeping her way into a life of nobility, but as always with Bioware characters, yes, she's cold and focused, but she has real depths, fears, loves, and prejudices of her own. 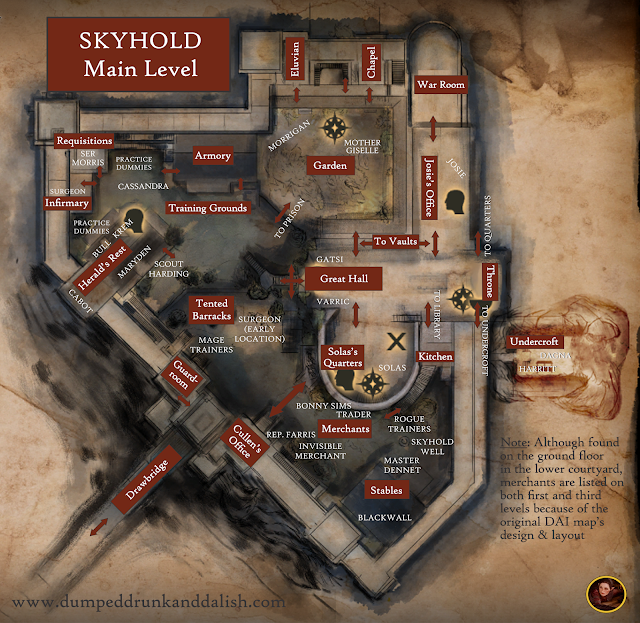 Shortly after our return from the game's first major negotiation in Val Royeaux, we can go search for Grey Warden Blackwall in the Hinterlands, and we also receive an intriguing invitation to visit the Storm Coast to recruit the mercenary captain, The Iron Bull (marvelously voiced by Freddie Prinze, Jr.). 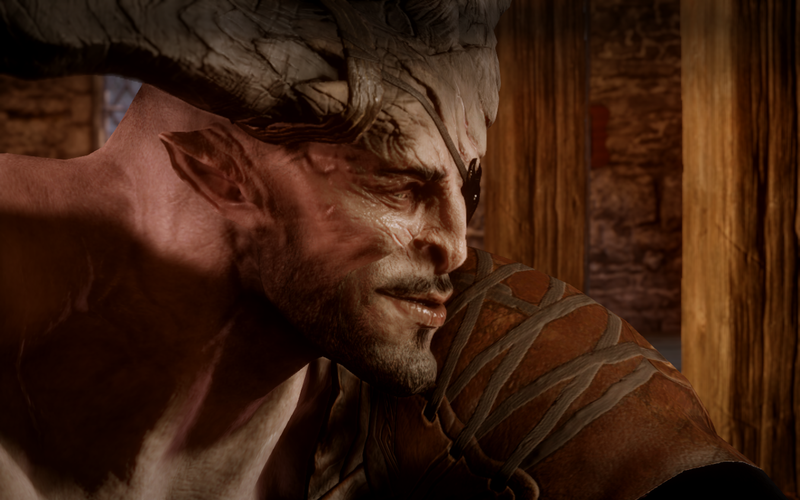 And now I'm gonna have difficulty reining myself in, because Bull, like Solas, turns out to be one of the most subtle, complex, rewarding and mercurial characters in the Dragon Age universe (and I'm gonna have a lot more to say about him in upcoming blog posts about him alone). complicated than that—and one of the game's best characters. At first glance, Bull's simply the obvious muscle. He's this big, bluff mountain of a man, a horned giant of the Qunari (the formidable warrior race we've met twice now, in DAO and DA2) who helms a likable, superbly capable band of misfit mercenaries called "The Chargers" as his personal combat unit. At first glance, Bull seems like a genial, if transparent, asset—he's so apparently open and honest that he tells you right away that he's a spy: "It might piss you off," he admits," but then he all but winks, just to allay our fears, calling out to his crew to pack up the booze and get ready to move. And it's all fine. He's funny, he's honest, he's a visibly capable captain and warrior, and he's on your side now. Don't worry about it. But Bull's so much more than that. He's more complex, more subtle, and infinitely more intelligent than he first appears. He's a contradiction in terms—he's everything he appears to be, to a degree—he IS a caring, capable commander, he is incredibly funny, affable and fun to have around. He's just also working several agendas at once, answering to both the Qunari back at headquarters in Par Vollen, as well as to you and the Inquisition—all while balancing his own private fears and yearnings to truly leave the Qun and go rogue (or "Tal-Vashoth"). Bull's defining loyalty quest, "The Demands of the Qun," is therefore an especially brilliant moment, as it's one of those quests that catches a character at their breaking point. your decision there will either evolve Bull into one of the game's most joyful and fully realized characters or will send him into a chilling emptiness with devastating consequences in the DAI final chapter, the DLC "Trespasser." named Cole. "I want to help." The last companions we recruit include the gentle and spiritual Cole, a gaunt, shy young man who speaks in alliterative, poetic words and phrases, and who seems able (among other things) to read minds. We also meet Tevinter mage Dorian Pavus, whose incredible handsomeness includes a curly mustache so flamboyant it has to be the source of a hidden superpower, and whose opinion of himself is only exceeded by his ability, kindness, and sense of humor. 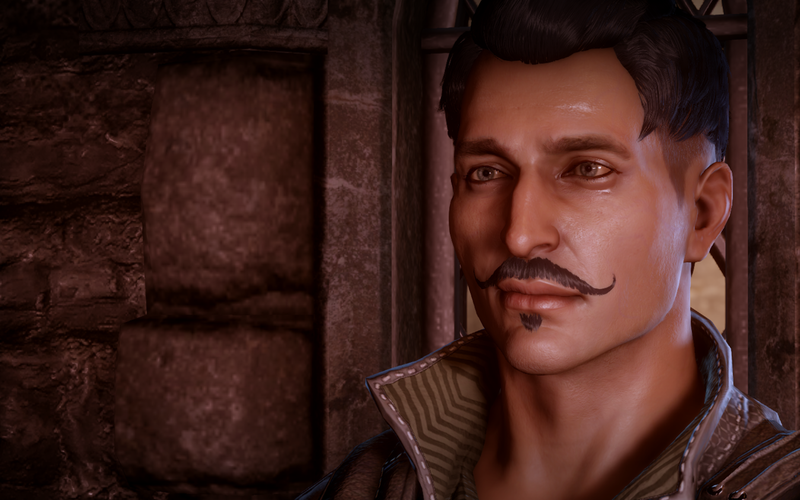 Like Bull, Dorian may be a representative of a hostile nation, but he's a lot more than that, and his personal loyalty quest is one of the richest and most moving in the game's storyline. The order in which you recruit Cole and Dorian is flipped depending on which faction you support (mages or templars) in the current world war—if you support templars (via the quest "Champions of the Just"), you'll meet Cole first, whereas if you support mages (via the haunting timebender "In Hushed Whispers"), Dorian will appear, with whoever is left appearing at the gates of Haven shortly after. These are your companions as your game gets underway, and depending on your character's choices, they will be your Inquisitor's advisers, friends, lovers, adversaries or enemies. The companions in DAI were easily the key to my falling in permanent love with the game, because they're all so richly drawn, beautifully written, and vividly acted. The game's approval system means that these people are all judging you, and will have varying approval or disapproval reactions to your quests, conversations, judgments, and actions. In other words, if you help a needy family in the Hinterlands? Bull, Solas and Sera—all constant supporters of alleviating misery and helping the common people—they will wholeheartedly approve every time. If you side with the templars, for example? Apostate mage Solas will disapprove. But if you side with the mages? Cassandra and Cullen will both voice their fears of the outcome. You cannot please everyone all the time, and navigating those opinions means that you will often have to wrestle with making decisions that feel right to your character, but which will also have tangible effects on their relationships. Meanwhile, the game's relationship approval levels range from "slightly approves/disapproves" across the gamut to "greatly approves/disapproves." This approval system is a vast improvement on DAO's rather simplistic "gifting" approval system (in which you could simply bribe companions with gifts to increase approval), and is also more subtle than DA2's "friendship/rivalry" system, as well. In addition, thanks to the game's occasionally inconsistent but beautiful banter system, complex and continuing conversations between your party members will evolve as the game's story goes along. The result? Some will discover mutual respect and companionship, some will fall in love, and others will turn active prejudice into a more subtle respect. Even your advisers feel like they have outside concerns and passions, revealing little moments of worry, fear, kindness, or cruelty during your War Table missions. These approaches mean that your companions feel more like living, reactive people than like purely static or literary creations. The DAI companions feel like they have lives beyond your character. They aren't just waiting for your character to show up—they're off doing their own things—writing, drinking, fighting, singing, spying, etc. There are strong and joyful characters as well as haughty, cold ones and emotive, wounded ones, and they're always interesting and (best of all) surprising. Many of them also have personal quests for your Inquisitor, and those for Dorian, Iron Bull, Cassandra, and others are genuinely poignant and often surprising in what they reveal. In the end, as in any great stories, it's the characters you'll remember most. DAI understands that, as games, shows or films all too seldom do.